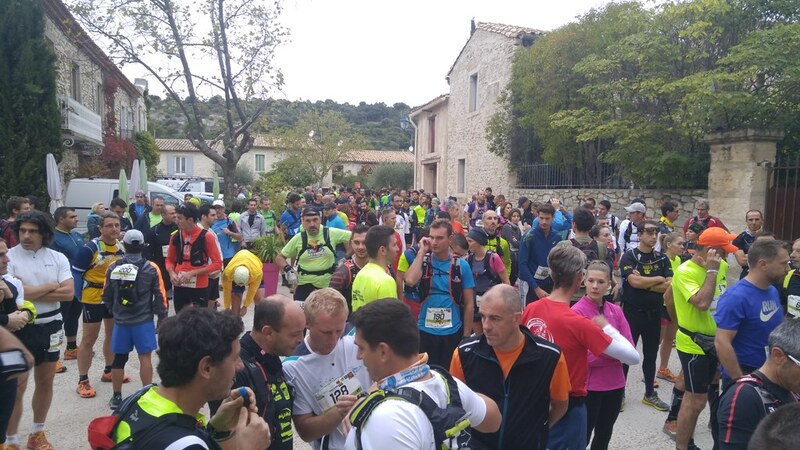 Last Sunday, the 16th, I ran in the 3rd edition of Trail des Calades, a 16.5 km trail run in the hills north of Montpellier. I downloaded my track from Runkeeper, converted it to GeoJSON, uploaded it to my Mapbox account (disclaimer: I work for Mapbox), and styled it in Studio for the map below. It's fun to see how much has changed since the last time I blogged a running map. It's all WebGL now, with changeable perspective, and the style editing is super slick. I particularly appreciated how the Mapbox editor suggests reuse of elements that already exist in the Outdoors style. Montpellier is on the interior edge of the coastal plain. The countryside north of the city is rolling hills dotted with limestone outcrops, all of it covered with live oak woodlands or vineyards. The Trail des Calades made a rugged loop through this landscape, starting and finishing in the town of Saint-Jean-de-Cuculles. 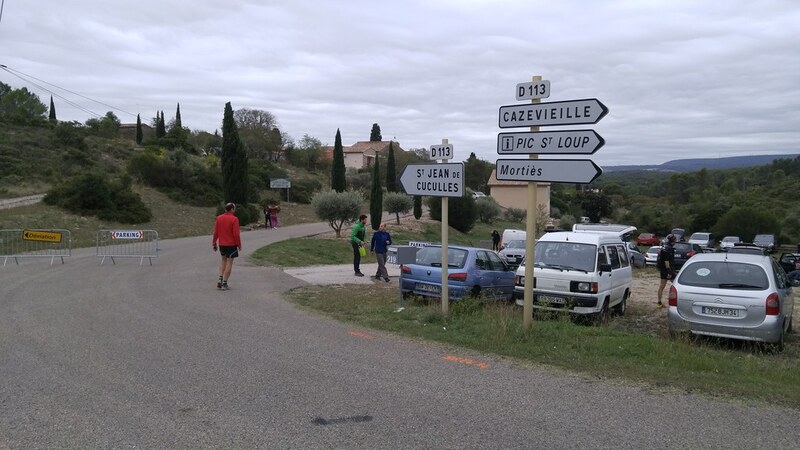 There was a short triangular loop through the cobbled streets of town after the start, in order to settle the pack, and then it was singletrack or jeep roads the rest of the way, counter-clockwise from the town up to the base of the Pic Saint-Loup prominence, and back. I'm not in great running form yet and didn't want to risk breaking an ankle or anything else with my 20k 4 weeks away, so I took it fairly easy, even stopping to take some photos. My time was 2:08:01. The winning time was 1:22:36! The weather was overcast and cool, but not cold. I went with no jacket and no water, planning to drink 2 cups at the mid-way station, and this worked out very well. In hotter or colder weather I might have geared up more like my fellow runners. Something like 320 people signed up for the race and 291 of us finished. The race was very well organized and staffed. There were bathrooms, and coffee! Course marshals, many of them pompiers (firefighters), were out at trail crossroads. We had a moment of silence before the start in memory of Jérémy Beier, one of their comrades who died fighting a wildfire in August. I stopped to take a photo at a mellow, wooded spot in the second half of the course, which was generally very steep and rocky or muddy. 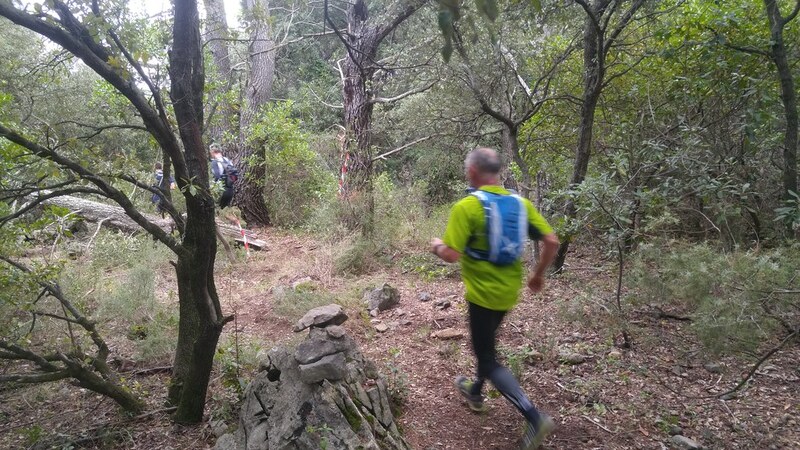 It was a very challenging and fun course, part scramble and part run. I'm looking forward to another race like this one.